If a farm pig escapes and joins a group of wild pigs, the newcomer won't take years to start shedding habits acquired over millennia of domestication. According to Pennsylvania Game Commission veterinarian Dr. Walt Cottrell, pigs "take only 30 days to become literally wild." Appearance alone isn't a reliable way to identify a wild or feral hog -- some grow thick fur and look boarlike, others still look like farm pigs -- but males grow razor-sharp tusks from upper and lower canines. Unlike the typically placid pink porkers on the farm, wild pigs can be aggressive and dangerous. Studies reveal that the Eurasian wild boar was domesticated about 9,000 years ago, first in the Middle East but later in different parts of Europe and Asia simultaneously. Domestication of pigs made sense: They cost almost nothing to feed, bear an average of 10 piglets per litter, increase their weight by 5,000 percent in six months and taste good. Writing in the "Cambridge World History of Food," historian Daniel W. Gade suggests that species Sus scrofa might even have had a hand in domesticating itself. This intelligent, opportunistic omnivore would certainly have noticed that proximity to human garbage dumps yielded a plentiful supply of food. Taking pigs on long sea voyages ensured that sailors had a ready supply of fresh meat. In 1493, on his second voyage to the New World, Christopher Columbus landed on the Caribbean island Hispaniola with eight pigs, ancestors of the domesticated and feral populations there today. Subsequent European ships "seeded" uninhabited islands with pigs so that on return voyages they'd reap a harvest of meat. 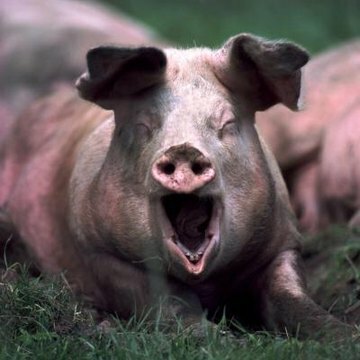 Pigs were introduced to the United States via Cuba by Hernando de Soto's expedition of 1539 to 1542; direct descendants of those pigs can still be found on Ossabow Island, off the coast of Georgia. When British settlers came to the New World, they also brought pigs. Despite the pig's record of usefulness to humanity, few animals have inspired such widespread disgust -- and with some justification. Before garbage disposal and sewage systems were widespread throughout Asia and Europe, pigs used to play a leading role in keeping homes and communities clean, in the same way they still do in some parts of the world. "Privy" pigs living one level below the toilet subsisted mainly on human feces. According to Gade, when the excreta generated by a family of four was supplemented with half a pound of garbage daily, it could meet the dietary needs of four young pigs. And well into the 19th century, pigs roamed the alleys of New York City, feeding on whatever they found in the gutters. As three-quarters of American states and four Canadian provinces have discovered, all you need to do to reverse-engineer domestic pigs back to animals much like their wild ancestors is to release them into the wild and let nature take its course. According to the Berryman Institute, a national wildlife management organization, feral pigs are one of the most serious North American wildlife problems today. Wild boars bred as game animals, and domestic pigs that have escaped from farms and interbred with other wild and feral swine, cause an estimated $1.5 billion in damage yearly. According to the U.S. Department of Agriculture, more than 5 million wild hogs roam free, savaging native plant and animal life, contaminating waterways and laying waste to croplands. More than 30 diseases carried by pigs are transmissible to livestock, wildlife and people; but historically, the most dreaded has been trichinosis, all but eliminated in farm animals but common among feral pigs now. Identified in 1835 when two British physicians found worms swarming in the diaphragm of a cadaver they were autopsying, trichinosis parasites are transmitted by eating or handling infected meat, primarily pork. The disease is rare now, but, according to Stanford University, at the beginning of the 20th century, one in six people in the United States was infected. The Berryman Institute says these worms gravitate from the small intestine to colonize the body's most active muscles, including the tongue, jaw and respiratory muscles. Untreated, trichinosis can be fatal. Anyone handling raw meat from a feral pig should wear gloves and ensure it's cooked to an internal temperature of at least 170 degrees. Salting and smoking meat won't necessarily kill the parasites' larvae, Stanford says.